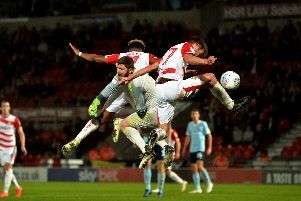 Who is likely to feature for Arsenal and how do Doncaster Rovers go about stopping them? Darren Ferguson says Doncaster Rovers are not going to Arsenal this evening just for a night out. Rovers are massive underdogs against the Premier League giants. And three successive League One defeats won’t have helped psychologically ahead of the daunting Carabao Cup trip to the Emirates Stadium. Ferguson wants his players to enjoy the experience but has also stressed the need for a good performance. “Stranger things have happened,” he said. “Us going there and winning the game would be a shock, of course it would. “But that’s what we’re aiming to do. We’re not going there for a night out. We’re going to try and get a result. “If you were to play Arsenal for the next ten games you’re not going to beat them more than they beat you. That’s an obvious thing to say. National media reports have speculated that Rovers could come up against an Arsenal side featuring the likes of Alexis Sanchez (pictured), Olivier Giroud, Theo Walcott and Jack Wilshere - so how do Doncaster go about stopping the Gunners? “We’ve got to stay in the game for as long possible but we don’t want to defend all game so we’ve got to be good on and off the ball,” said Ferguson. “We’ve got to make sure we’ve got good distances and really good communication is vital. “When we get the ball we need to be good with it and cause them problems. Jordan Houghton is likely to start the game after missing the defeat to Scunthorpe due to illness. Tommy Rowe is also available despite taking a knock during the closing stages of Sunday’s game.